My story is about a woman’s self-worth. The emotions are the same for all of us regardless of “story.” Lessons from life give us an awareness of choice and a rainbow after the storm. There IS a light at the end of the tunnel and it is not a train, it is the knowledge of YOUR Divinity and the Divinity of everyone. Earth is a school and we are fortunate enough to have many students accompany us along our way, making sure we experience and learn the lessons we chose to learn before we were born. Happiness is a choice and we choose that joy through the love of self and others. We gain confidence in our own truth by voicing what we believe. My human journey was the crucible that prepared me to fulfill my promise to Mother. The events that shaped my life and the preconditioning that dictated my choices were a blessing in disguise. Although they did not feel like blessings, hindsight has shown me that I would not be who I am today or even where I am today without those events. Today I live on a lake in a small town where it is blissfully quiet. I have many birds to watch and the water which has a life of its own. I need only my small house and not a mansion to live in. My children are grown with children of their own and I have the ability to see the rainbow after the storm. Without that storm, I would not have the rainbow or any of the deep peace that envelops me. Be not afraid of the storm; always look for the rainbow because it will appear. The light at the end of the tunnel was for me a light from Beloved Jesus and Mary. They brought me from the depths of despair and frustration into recognizing that God is in everyone. Everyone has a piece of God within and the only requirement to know that is to allow yourself to see the piece that is within you. Love yourself and you will love others. Forgive yourself and you will forgive others. You cannot help it. That is called Unconditional Love. Mother’s love is a pure example of this. 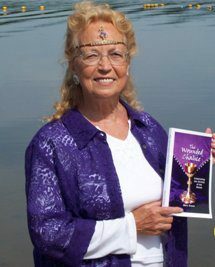 To purchase Book: The Wounded Chalice is available from Author, Mary Grace as soft cover copy, Audio book, or Electronic EBook @ TheWoundedChalice@gmail.com or call 413-245-3977. Digital version from Kindle and Nook, etc. Amazon, Barnes & Noble, and other book stores carry it also.